This example shows how to display text on the console, as well as get text from the user. It also shows how to set the text color, background color. Provides a usage example of the intergrated progress bar function. Essentially, all the basics of CLI (Command-Line Interface). This example is basically a follow-up of example 1. It shows a way the interaction between GUI and CLI can be implemented. Essentially, a deeper look at the "basics". This example was originally implemented to push the limits of LibCon a little further than the "basics". 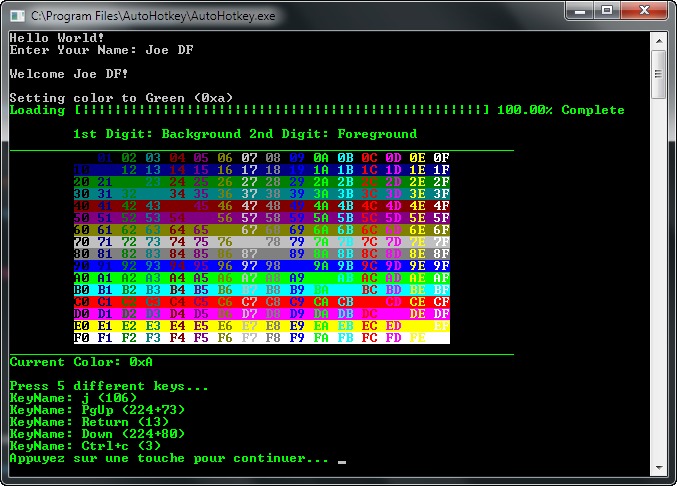 It involves a DOS style GUI, similar to Word 5.5a using "text-based GUI". This is considered to be a more profound example. It has been simplified and commented greatly to demonstrate the basic concept of "drawing" in the console, or otherwise, "GUI drawing". Essentially, an example that takes a deeper look at the more advanced console functions.